Marinate the chicken: Before placing the chicken into the marinade, set out on a large cutting board and cover with plastic wrap. Use either a meat mallet or a rolling pin to flatten the thighs. Place into a large Ziploc bag – add the balsamic vinegar, olive oil, water, mustard, honey, oregano, garlic, salt, and pepper. Close the bag, and gently move the chicken around inside the bag to cover and mix with the marinade – set into the fridge, and allow to chill for at least 45 minutes and up to 2 hours. Make the roulades: Thinly slice the blue cheese, and set aside. 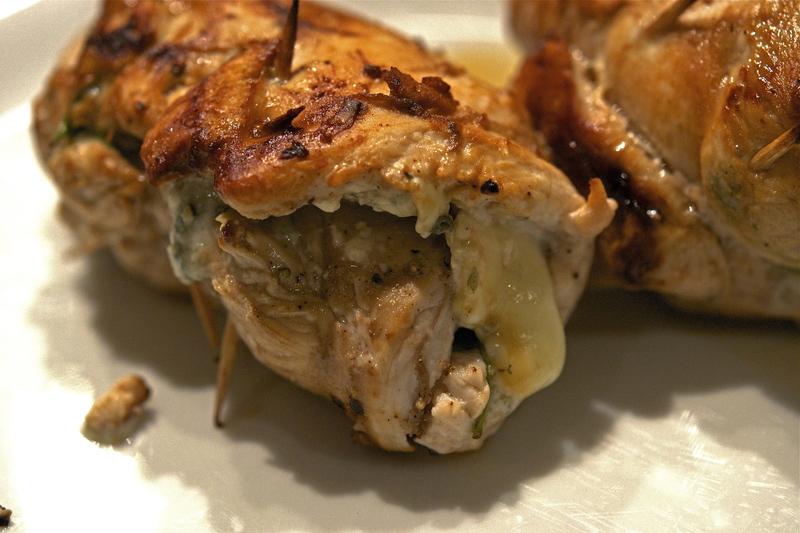 Remove the chicken from the marinade, and set onto a large plate – one at a time, layer slices of blue cheese over each chicken thigh, and top with a thin layer of spinach leaves. Add a few grinds of freshly ground pepper and a dash of salt. Roll the chicken (as you would roll a yoga mat or tortilla) until it’s a “roulade” – fasten using wooden toothpicks that have been soaked in water for at least 30 minutes. Repeat with the remaining chicken thighs. Sprinkle with a touch of salt. Cook the chicken: Preheat your oven to 375 degrees. Heat an ovenproof pan over medium heat – cook the roulades until browned on all sides (may need to do this in batches depending on how large/small your pan is). Once browned, return all of the chicken to the pan and set in the oven for about 40 minutes (may take more or less time – thighs should be cooked-through fully). Remove from the oven and serve immediately.